Friday night, wrapped in a blanket I watched a film called Snow Valley on TV. Very much a straight to TV movie, starring no one you’ve ever heard of and a pretty cliche story line. The thing that really got me was all the lovely Christmas traditions the family had. They very much had a programme of Christmassy events all the way through December, from decorating the tree and wrapping up presents for less fortunate children to icing gingerbread houses and indulging in the grand-sounding Feast of the Seven Fishes. With no children in the family we are currently in that awkward limbo phase where we’re too old for the Christmas ‘magic’ ourselves, but too young (I say too young- I’m 27! Rather we’ve not in the position) to have our own children. But that doesn’t mean I don’t want to celebrate to the extreme. I’ve got a few ideas but I’m definitely going to come up with some more. I refuse to even talk about Christmas until after my birthday in November so it’s literally just starting to cross my mind. 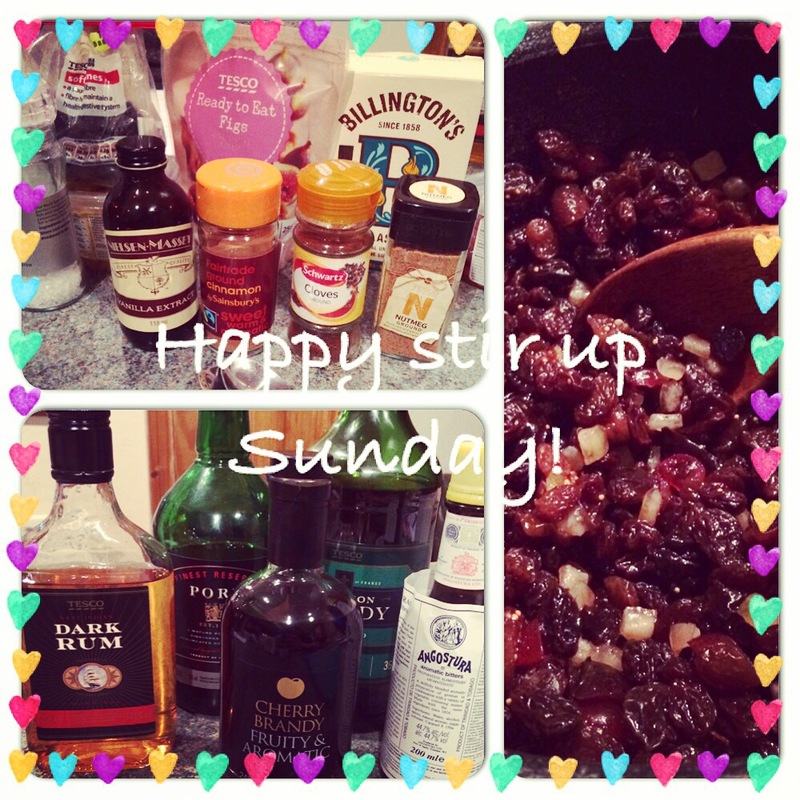 The starting point has to be Stir Up Sunday, which this year was Sunday 23rd November. My mum and I are huge Christmas cake and Christmas pudding fans. In fact we eat Christmas pudding throughout the year, smothered in custard. We usually make a cake but had never really got involved in SUS, mostly because we’d never heard of it. We are both great believers in lovely family traditions so here we are. We got Nana involved too, reading out the ingredients as I got them out of the cupboard in a way that only a nan can! I did have quite a hangover on Sunday so measuring out volumes of alcohol was a bit gagworthy! Once I’d got over that I mixed in the various dried fruits, heated for 15 minutes on a low flame then left to cool. It’s now going to sit in the fridge sorting itself out for a week before we make a start on phase two. I read on the internet earlier that it’s good luck for everyone in the family to have a stir of the cake mix so that’s what we’ll be doing!